Please welcome Elena and her Dachshund Moo to the blog. I introduced her in our 6-year anniversary blog post yesterday . Today is her first guest post on the blog. Below is her review of the Natural Paws paw, ear, and skin products. Moo and I recently moved to Washington from Texas. With changing climates and activity however, Moo HAS experienced some minor irritations, such as scratchy paw pads from hikes and dry skin due to the drier air in this area of the country (in regards to humidity of course, DEFINITELY not rain). I recently received a gift bag of three Natural Paws pet care sprays from Jessica that were designed to combat some of these discomforts, and Moo and I have both been pleasantly surprised. 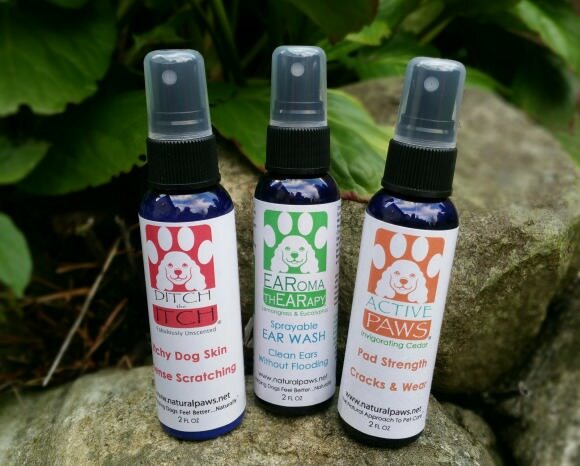 The sprays that were included in the bag were Active Paws, Ditch the Itch and EARoma ThEARapy. 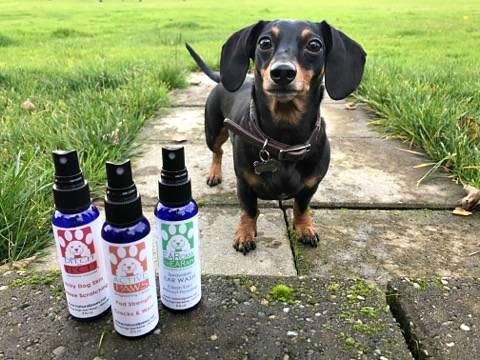 A big selling point for me is that Natural Paws takes a holistic approach with their products and focuses on using natural, organic ingredients to soothe and heal skin discomforts in dogs, rather than steroids. As a Bioenvironmental Science major myself, I appreciate this environmentally conscious approach and felt at ease knowing that Moo would be fine if she ingested some of the products I was spraying on her. Just running through a few of the ingredients, these sprays contain a lot of herbal infusions, essential oils, aloes, organic leaves and flowers, nettle leaves, flax seed oil etc. I really adore this company’s use of Mother Nature’s very own healing, non-toxic properties, and it seems a lot of the veterinarian community approves as well. Anyone who’s ever had to flood their dog’s ear canal knows that it can be messy, difficult and frustrating for both dog and human involved. The EARoma ThEARapy creates no mess whatsoever and is incredibly easy to apply. Luckily, Moo has never had a history of ear infections, and (honest dog-mom moment), I had never paid a whole lot of attention to condition of her ear canals. She did have a small amount of grit and dirt upon inspection, so we included this spray in our morning ritual. Surprisingly, Moo wasn’t bothered at all by the ear spray. There was a slight hesitation in the beginning, but she quickly got used to it and had no problems with me doing my work. All this product requires is two sprays in the canal, massaging the ear to loosen up dirt and grit, and a cotton ball to remove it. Hilariously, this mandatory ear massage would always turn into a few minutes of pampering because Moo just adored having her ears rubbed, and was lulled to sleep every time. Like I said, there was no leakage or mess, and again, the spray had a very natural and soothing lemongrass smell. The product worked great, and Moo’s ears are now squeaky clean and dirt free. Active Paws was the spray product I was most excited for. Scratchy, irritated paws were the biggest issue I was noticing with Moo after taking her out on hikes. Her heart and her head were ready for the mountains, but her poor paws weren’t. She would typically lick her paws for the next few days after adventuring outdoors, and I knew she was feeling some discomfort. This was one of those awesome timing moments because the same week I decided I would start looking for creams for Moo’s paws, I received the gift package from Natural Paws. Active Paws itself just requires you to spray your dog’s feet 1-5 times, depending on the size, for up to a week (I sprayed Moo’s paws twice just to make sure I got all the cracks and crannies). Moo and I began a morning ritual of cuddles and “spray time”. In general, Moo doesn’t like her paws to be touched, and these spray-meetings were initially met with much squirming and disgruntling when she felt the spray on her feet. With consistency, however, she eventually got used to the whole shebang. After a week, her paws were noticeably darker and less rough to the touch. I can’t say that the spray halted the licking entirely, but It DID decrease noticeably. The spray itself absorbed and dried quickly, and smelled absolutely phenomenal and “outdoorsy” with its invigorating cedar scent. In addition, the spray is anti-fungal, anti-viral, anti-bacterial, AND is a natural insect deterrent. I read on the website that some people used this spray as an “all-over” spray to prevent insects and may try this myself in the summer months. Ditch the Itch spray was designed to put an end to the constant nibbling and scratching for those dogs that seem to be “allergic to the world”. As I mentioned prior, Moo has started to experience a little bit of dry skin with the climate change here in Washington, so I was excited to see how this spray could help. Luckily, her dry skin is pretty mild, and she only had a few places in the armpit and hindquarters area that needed attention. This product directs that you spray a minimum of one pump, to as many as you feel might be needed, onto the dry skin. You just pat it in and wait for the magic to happen. I sprayed Moo’s dry zones every day for a week and actually did see a noticeable difference. Dry skin isn’t healed in a week and it didn’t completely go away, but the area does seem to be healing pretty well with the added moisture and soothing ingredients, such as aloe and nettle leaf. Most importantly, it’s provided Moo with the relief needed for her to stop nibbling and licking the areas as much so that they CAN heal. Score! As I mentioned before, Moo’s dry skin wasn’t terrible. Because of that, I really can’t say how effective this would be with severely dry skin or rashes that cover large areas. However, I can say this product does an awesome job of moisturizing and soothing slightly irritated, itchy skin, which in turn can aid in the healing process. 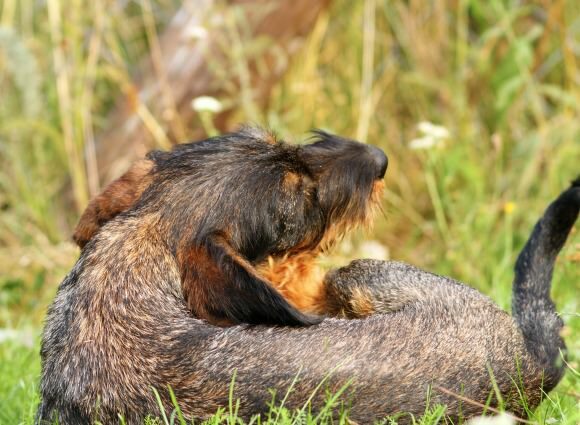 If your dog suffers from really severe skin conditions, however, they may end up needing a product with a little more kick and possibly steroids, which is a conversation for you and veterinarian. The spray bottles that I was given were 2 oz, which was enough to adequately spray Moo for a few weeks, but a bigger dog that would require more spraying would likely run through those bottles pretty quick. And, as with any product that utilizes natural, botanical ingredients, you should expect to pay a little more. For example, the 2 oz bottle of Active Paws costs $20, and an 8 oz bottle costs $71.95. This is a little pricey for my general budget, BUT, like I said, these prices aren’t uncommon for organic products and I would gladly pay it if Moo had chronic skin conditions. Overall, I was really pleased with the results from my Natural Paws products. They minimized Moo’s discomfort and moisturized her skin, which is exactly what I was looking for. Since using these sprays, Moo has calmed down with the licking and nibbling, which tells me that the products are working, and therefore encourages me to continue Moo and I’s outdoor and upward adventures through Washington’s mountains. Hm, I may have to try this on my crew! Does anyone else think doxie feet are some of the funniest things in the world? Every time I take care of my mini-doxie’s feet, I have to giggle about how funny they look! Little, tiny paddle-feet! I love all of our canine family members, but our miniature, long-haired baby-doll has made her way straight into my heart to become my spoiled darling. This website has opened my eyes to her needs as a hunting, active dog. At 10 pounds, she is on the small size for a mini, but her mental and physical needs are the same as, if not greater than, our other dogs. When I take her outside, I have to resist the urge to pamper and coddle her due to her size. I need to remember to let her be adventurous (but safe) as she explores her environment. Thank you for helping me understand her needs! Doxie feet are indeed cute. I hear they are that big so they make great shovels for digging 🙂 I’m happy to hear you’re focused on giving your pup enough exercise opportunities.